1. Simple structure, beautiful appearance, since the whole machine is made of H steel, after the process of welding and integral processing, it has a good performance in structure, load ability and steadily. 2. Our machine uses automatic measurement to mold and cut, high precision, both edges are cutted trimly, good performance in nondeforming. 1. The 840 flat sheet roll forming machine owns simple structure and beautiful appearance. The machine adopts H steel structure, after welding and processing, it can work steadily. 2. Our roll former adopts automatic measurement and cutting instrument. It is of high precision and no deformation. Founded in 2000, Yingkou Professional Roll Forming Machine Co., Ltd is a professional manufacturer and supplier of steel drum production line, flat sheet forming machine in China. Here, we mainly provide steel drum production line, arch sheet equipment (PRO-120 arch sheet forming machine, PRO-240 arch sheet forming machine), arch sheet project, PU spray and perfusion machine (polyurethane foam spraying machine, high-pressure polyurethane spray and perfusion machine), roll forming machine (such as highway guardrail forming machine, flat sheet forming machine, etc), colored steel coil, and pipe bending machine, etc. With lots of experienced professional technicians and convenient transportation, we have gain favor of customers from many different countries around the world, such as Mexico, India, Russia, Ukraine, Slovakia, Turkey, Romania, Iraq, Colombia, Albania, Mongolia, Argentina, Brazil, Peru, and Guatemala, etc. If you need flat sheet forming machine, please contact us. 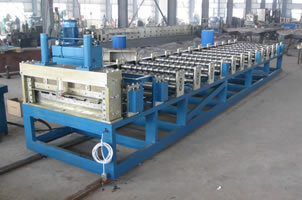 Corrugated Sheet Forming Machine1. We use Automatic control software to manage productive information.